Is there a better way to start a new year than with a day off that isn’t on the weekend? It feels kind of… a stolen, right? Sitting here on the first official holi-day-off of 2019 – and a Tuesday no less – it occurred to me that it might be nice for the first blog post of this year to be aspirational yet attainable and something we can do together. Something that makes us feel good and accomplished by years end. And of course, something tea related. As I sat here today thinking about all the possibilities for 2019, the resolutions that are made, the promises to ourselves to do better, it occurred to me that it might be nice to do a book and tea pairing/recommendation each month until the end of the year. On the 1st of each month, I’ll post a suggested book to read and a tea that might be a lovely compliment. Perhaps it might be one you’ve tried before or maybe one you’ve never had and would be willing to try. If you’ve read the book suggested, perhaps it’s timely to read it again? In any case, this is a great way to introduce ourselves to 24 new things in this new year to stimulate our minds and our senses. Let the nerdish fun begin! Have you read the this book? If so, it’s another chance to re-read it for its 25th Year Anniversary. If not, you might find this book life changing. There is simply no better way to begin the new year than with a magical book like The Alchemist. Are you a Jasmine Tea lover? If so, Jasmine Yin Hao is one not to miss. Technically a Pouchong, it’s one of our most favorite scented Jasmine teas. Spring-harvested green tea for the base tea. The buds are handpicked, then withered and dried. The finished tea is then stored to await the blossoming of late summer jasmine. Pouchong is known as Chinese Green, however, it is only slightly fermented (10%-20%). When brewed, it produces a light yellow hue, a milder flavor than Oolong tea yet stronger than Green tea and is recognized as the finest in the world. I hope you decide to join in, find a new book and tea to make you feel joyful and connected. If you don’t already follow us on Instagram, Facebook and Twitter, we hope you will and share your thoughts about the book and the tea. Welcome 2019! May it expand your mind and tastebuds! Don’t let the photos of the upcoming week fool you. This is not a tea tour. This is oolong bootcamp. Proper shoes, dress, electronic equipment, notebooks, hats, bug spray, extra vitamins, (and for me… dramamine) is in order. We officially kicked off the 3rd Annual TOST: Taiwanese Oolong Study Tour (my 2nd time) last night with a welcome ceremony by the TTMA and it fearless tea leaders: Jackson Huang, Norman Shu, Ted Fan, and Thomas Shu. We all introduced ourselves and talked about our passion for tea and why we signed up for this kind of adventure. (Little do these TOST: Rookies know, but the week ahead will be filled with long bus rides, mounds of information and late nights processing tea.) After introductions and a look at the different cultivars we are studying, we headed out to our welcome dinner, which will be one of the many enormous, sometimes lavish meals we will have during the week. Of the 17 of us in the group this year, only 3 of us are TOST: veterans: me, Bob Krul and my pal Ken Rudee, Chairman of STI. After further exploration and working up an appetite, we were invited to lunch. It was heartwarming to be greated by volunteers of a Buddhist organization working with the Tzu-Xin (mercy heart) Tea Farm who worked to create wonderful vegetarian dishes, many of which were prepared with tea. It was hard to control myself and not go back for 2nds and 3rds! “Mercy Heart” encourages members to promote the benefits of a healthy environment (ie: organic teas) and live a life that is happy, healthy and promotes charity in line with their mission. They support local tea farmers and conversion to organic practices. I loved the spirit, energy and overwhelming generosity of these people. As we sat and listened to their presentation about how all of this is accomplished, we were greeted with building wind and rain. Yes, the first typhoon was heading our way. The sound of the rain coming down onto the trees and leaves was soothing to me. Yes, the danger of a typhoon loomed, but the magic and mystery of an afternoon exploring tea fields, dining on a glorious vegetarian lunch prepared by Buddhists and sipping organic tea trumps the rain. That very rain is what caused us to skip our scheduled walk through a converted organic tea garden, but quite frankly, I didn’t mind. I never tire of far away tea gardens. I never tire of meeting new TeaPeople in far away places. And I never take for granted the good fortune that lead me into this weird, wonderful world of tea. Sip tea, people. And feel the love and happiness from the people who made it… just for you. What’s the difference between Green tea and Jasmine tea? That was a question asked of me yesterday when I was at the Interact 2008 2-day conference in Washington DC. I was talking with Rohit Bhargava, one of the speakers, at the happy hour after the event. While its true, that my day job consists of graphic and web design, and the crazy world of advertising… most of my “other” time is spent drinking tea, learning about tea and selling tea. Any chance I get to talk tea is a treat. So poor Rohit made the mistake of asking me the simple question: “What’s the difference between Jasmine tea and Green tea?” which of course sent me into a “tea-state” where I think I rambled on for a good 5 minutes about it. It was a good question and one I’ve never been asked before. Basically, jasmine tea is really green or pouchong tea scented with jasmine flowers. The jasmine flowers are harvested during the day and stored in a cool place until night. When, the flowers bloom in the evening the full fragrance comes out. The flowers are layered over the tea leaves which is called the scenting process. 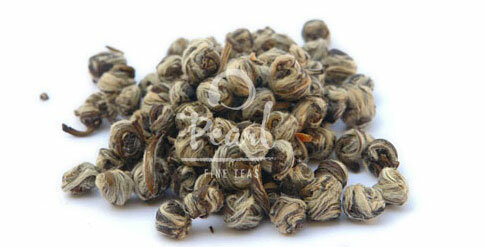 The quality of Jasmine tea is determined by the quality of green tea used and the effectiveness of the scenting. Anyway…Rohit is pretty darn cool and knows what the scoop and then some on technology, Social Media and Marketing. And now he knows what jasmine tea really is. Check out his blog and new book!